It is no wonder that a modern wind turbine looks so beautiful. As its design has evolved over the past century, it has been gradually streamlined to take best advantage of the natural power that the Earth provides. We are not the first species to make use of moving air, of course. It has been of benefit to birds, bats, and butterflies, over many millennia, by allowing them to develop a superbly efficient form of locomotion. Birds are able to glide or flap towards their desired location, whether on a balmy day or in the face of an oncoming gale. Their relatively large, flexible wings and adjustable feathers, ensure that they are very sophisticated aviators. Many insects are skillful hoverers. They flap their wings to fly to their source of food, but once they have reached it, they use the air for support, rather than as an invisible force to pull against. Maybe hummingbirds have taken inspiration from their invertebrate colleagues, as they hover in front of nectar-filled blossoms. It was with sailing ships that humanity first made use of the wind, which has always been steadier and stronger over water than over land. However, not until the invention of the windmill, about two thousand years ago, did we utilize the power of the wind to generate a new type of energy altogether: The translational motion of the air was converted into rotational energy, by being used to push against sails mounted on an axis that was free to rotate. Our ancestors then had power available for a variety of purposes - to raise water, or grind corn into flour, for example. Our primary source of power, though, for many millennia prior to this time, and up until the present day, was, and is, fire. Early hominids created it by rubbing two sticks together to create smoking charcoal, which could then ignite fluffy seed heads and other dry plant material. The resulting heat allowed their caves to be warmed, and their meat to be cooked. With the complexity of human life increasing, the creation of metal - specifically iron - became more and more important. In early times, the ore that was found in the Earth's surface was warmed, made malleable and then banged into shape by hand. Tools and weapons were the desired end products. Over subsequent centuries, the extraction of the metal from the ore, as well as its purification, and the variety of its end products, all became more sophisticated. The Middle Ages saw the rise of the manufacturing era. By the middle of the nineteenth century, there was a further refinement of iron production, and steel was created. Characterized by both hardness and toughness, steel allowed for explosive growth in the variety and size of the structures that could be built: railroads, bridges, freighters, buildings, vehicles and countless other products. The development of electricity generation and transmission occurred in the same period. Everyday lives were positively transformed by this new stage of the industrial revolution. However, those lives have also been negatively affected. The enormous amount of fossil fuel burning, which was required for the production of steel and manufactured goods, has meant that the population close to sites of manufacture have had to endure living in sooty, unhealthy surroundings. Although some of this damage is being cut back, the most dire result of modern human activity is invisible. It is the emission into the atmosphere of a vast amount of carbon dioxide, which then traps heat, and severely disrupts our climate. Polar ice is melting away, ocean water levels are rising, severe droughts are taking place, and many equatorial regions are becoming too hot to support life. Without a rapid change of behavior, mankind will soon make the world unlivable, not just for us, but for all the other creatures that inhabit the Earth. It is essential that we stop this suicidal behavior, and return to using, rather than destroying, the world's resources. Nature can give us the inspiration for the revolution we need. Millions of species continue to use moving air for their physical support. Without mechanical aids, our own species cannot do that. Nevertheless, we have managed to collect, store and re-use that energy which floats above us. In fact, wind power will be one of the keys to our future survival - though its production will need to be dramatically increased, worldwide, if our planet is to continue to support life. 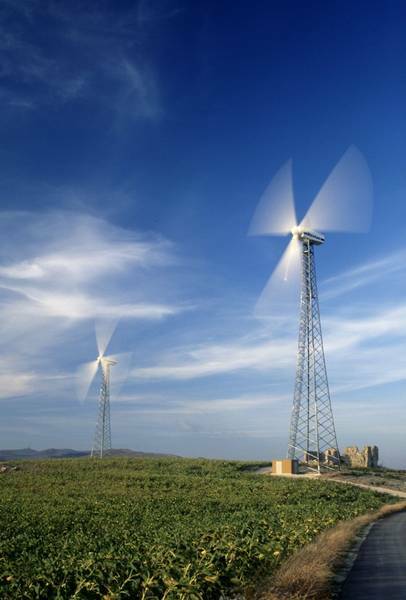 The aesthetic and simple design of a modern wind turbine stimulates a feeling of connection with the natural world. It represents an evolution in the process by which all living beings make use of nature. The refinement of design to fit need is surely what evolution has been all about. Now is the time to acknowledge that crucial fact. For more from Sarah Taylor see her website Windustrious Cleveland promoting wind development on Lake Erie.